A few weeks ago I decided to open up my coaching services for one day only. The results of this 24-hour period were gut-wrenching … for my clients. In this round of consulting I noticed a lot of my clients were — like so many online — focusing their content on precisely the wrong thing. They wanted to make money by helping people — but in the harsh light of day, their websites painted a very different story. Results from my consulting questionnaire, the domain names used and content on their sites, made it clear that my clients were consistently focusing on one thing … themselves. I softened the advice to my clients by telling them that nobody cares about me either. At least not until I give my readers something to care about. A concern many of them had, which does make some logical sense, was that if they didn’t focus their site content around themselves, they wouldn’t be able to build their personal brand effectively. I threw out an example based on my own experiences of building multiple successful blogs, all of which didn’t include much personal branding in the content. On ViperChill, for instance, around 400 people per month land there by searching for variations on my name, Glen Allsopp. I say variations, because a lot of people like to call me Glenn, but that’s a rant for another day. My full name is only found in one place on that site. It does not appear in my posts, it’s not in my comments, and it’s not in the sidebar. It doesn’t actually appear on any static page on my site. I may have mentioned it a couple of times, but it’s hidden in the post content. As a matter of fact, the most common instances of my full name are on other websites in things like interviews, guest posts, and reviews of products I’ve created. The only reason I get interviewed and attract people who want to promote my products, is because people like what I have to say in the first place. They trust me. They know I can help them with their problems. Then they want to know more about me. Your readers care about themselves first and foremost, not about you. They only start to care about you when you give them value that they keep coming back for. In time, they become curious about who is behind all that amazing value, and that’s how you start to build your personal brand. There are literally more than 100 million active blogs out there, so it’s not that easy to get noticed and in turn create a lasting connection with your audience. As a lot of blogging advice will rightly tell you, being personal in your posts and activity online is one of the best ways for your readers to learn more about you, and engage in the content you’re consistently putting out there. It’s no coincidence that I know quite a bit about some of the biggest content creators online. I know that Brian has been an attorney, a real estate broker, and an ezine marketer back in the day. I know that Darren Rowse (I don’t even have to tell you his website, another case in point) lives in Australia with his wife V.
I know that Sonia has a young son and rocks an awesome pink hairdo. I don’t know these things because they go on and on about them. I know them because I love the content that they write, and in time, through a series of articles I follow, get to know a little more about each of them. Being hooked on the value they consistently provide to me is the only reason I have come to learn more about each of them. I’ve done a lot of split-testing lately, and have an example which proves my point even further. Can you guess which one resulted in the most conversions? The second headline outperformed the first by a huge margin. The reason being that the first headline put the emphasis on me, and the second put the emphasis on the reader. If Brian and Sonia started putting out content here which mostly focused on their personal lives, I’m sure they would quickly find their audience engagement levels decreasing. It’s the Copyblogger core philosophy of creating content that benefits readers … week-in and week-out … that keeps the subscriber numbers growing. Don’t automatically assume that you need to talk about yourself all day and plaster your site with personal interests and ongoings in order to build up your brand. From my own experience, and with examples taken from some of the biggest blogs online, being personal — but subtle about it — is usually a far better route to take. Glen Allsopp writes guest posts just so people can discover what his surname is. You can find him writing about marketing over at ViperChill. Excellent points! Your site has got to convince visitors why your product/services can make their life better! It’s not about what you can do, it’s what can you do for them! Yep I agree with Nick. Anyway, great post! I could only add utilizing social media and using small ads. I like this post a lot because it’s such a big issue online. The “giving is the new selling” is a good way to describe this. You have to give your readers value before they are valueable for you. How much has your “future of blogging” been retweeted? It was great, thank you! The web has been interesting in that regard, it’s almost a requirement nowadays to give away at least a freebie or a free trial to get people interested in anything, as there is so much variety and other options available. It’s been a relatively good thing though, as now people get access to great free content from a lot of people looking to make their mark, and marketers get access to a growing list of people to sell to by providing content that is actually useful, so… win-win? Glen, I couldn’t agree more. Any blogger who sells should use the 2nd person “you” voice on their posts and sales pages (Thank you Jon Morrow for your guestblogging class). Study Jon’s Copyblogger posts and you will see “you, you, you, your” and not, “I, me, our, we, us.” Such a simple fix, but I see this problem time and again. Thanks for the comment Shane! It’s a cool technique… and if you add in a little role-play, it’s fun too. Ex. Imagine for a minute you are me and a few weeks ago you decided to open up your coaching services for one day only. The results of this 24-hour period were gut-wrenching … for your clients. In this round of consulting you noticed a lot of your clients were — like so many online — focusing their content on precisely the wrong thing…etc, etc. People are interested in a small bit of personal information about you, but they don’t want to know what you ate for breakfast or what color various body fluids are unless you can somehow relate it to something that will benefit them. Yes, I would definitely click the second title – why, because if you tell me that you’ve gained 10,000 subscribers, I’m going to think – well, that’s because YOU have a great site – it’s going to feel less achievable. People want to know how they can achieve what you have – that’s when they’ll begin to care. Thanks again for sharing your awesome insights. You are absolutely right. I’m reminded on the old adage:’ Do Unto Others As They Would Do Unto You’. Concentrate on other people then in return, they may focus on your website. This is my second post on your website. You’ve got plenty of information to add to my resource box. You know what Glen? What I don’t understand is how you went to page 14 with only 14K subscribers. That bothered me at the time, and it still does. Use your powers of extrapolation to uncover the identity behind Blog Tyrant. I’ve been investigating that sneak for six months and I’m getting closer. Not sure what you mean about page 14? Ain’t fair. My BIG client knows who Blog Tyrant is too, and he won’t tell me. 🙁 How crazy is this? I’m playing scrabble with Tyrant and I don’t have a clue what his name is. 14. Alexa. Top Internet. You know. Hah. Okay, now I’ve got it. Thanks for sharing! Great tips. As I’m lining up blog content, your post is incredibly helpful and timely. Great post; capitalizing on the fact that people are me-oriented and you need to give them what they really want. Thanks for this, Glen. Always great to have you at Copyblogger. I have massive respect for you! You would think that your comments would be intuitive with people however what I have come to learn is, to be effective, you need to focus on one of two simple mantra’s “what does it mean to me” me of course being your target audience or, “so what” meaning, what value will I extract from the message you are trying to get across. Hey Glen, you have a site with good content, ok, I see that your site not updated often but It still have big traffic, and I think that is because your content give readers many useful information. Also this post, you provide readers( who is webmaster) the tips about way to make readers cares on their site content. Frankly, this is an issue I’m having right and of course, I want to thank you so much for great article, It’s very useful. This is a great post. I’ve noticed that Copyblogger does the least amount of “personal branding,” but it’s the one blog that I come back to again and again. The reason? It provides great content that benefits me. Your example is also helpful: People like headlines that show what is in it for them. Thanks for reminding us all about this again. I supposed solveyourmysterysymptoms would have been a much better website title but I knew nothing about anything when I built the site a year ago. I wonder if the name itself is turning people off? An easy cheat sheet: Write in the 2nd person. I’ve heard it said that the bigger the copywriting client, the more time has to be spent changing “we” to “you” in everything from brochures to websites. It all boils down to sales. It is important to build up a relationship. A little bit of personal information given out over time strengthens these personal connections, but it is fine line. What is your most effective way of getting into readers heads? What steps do you go through when creating content? I’d start by asking: what kind of questions are they asking that you can provide answers to? I look at myself. What do I want to read / do / see? Great post and all I can say is, “you ain’t kidding”. I have a client who just recently began two blogs and against the strategy, use the blog to promote their products – which isn’t bad if it’s done a manner to benefit but their posts are just links to their heinous website and all of the blah, blah, blah they can muster. Their response is, “We B2B” and my response is that EVERYONE is human and between all the B2-BS there are PEOPLE reading their posts – but they won’t be for long. Great article Glen. I agree with your quote. i.e The only reason people read any blog is because of the value that they get from it. Over the months, I’ve really gained a lot from you content wise and plugin wise. 🙂 Thanks bro. Great analysis. I’ll be going back over some of my post headlines changing ME to YOU. Time to refocus. Awesome to see you over here! Great post, Glen! Do you think this applies to personal blogs that tell stories, as well? I know a lot of people who have considerable followings and are just sharing their lives online. It seems that those readers ARE tuned in for the blogger’s voice and personality. Thoughts? But it is such a difficult piece of advice to put into practice. The essence of the rule itself makes it difficult to execute. It takes effort to stop thinking about ourselves when we write for the very reason it is powerful to think about others first. You have concentrated my own thoughts. SO true– yet SO MANY people still think they are supposed to talk about themselves instead of making it about their readers. Like someone else said, it’s a hard concept for people to wrap their heads around. But it can start with putting yourself in the reader’s shoes and asking WIIFM (what’s in it for me?). I’m working on a post about this very thing for a site I’m a contributor to and I’ll definitely link to this as extra reading. Great post! “Nobody cares about you.” <== Absolutely right! They only care about their problems and finding solutions/answers to their everyday problems and questions. My rule of thumb: “Seek to be helpful first…” And like Brian said in his webinar today, through educating, you’re effectively selling. Ah, such a great post. “Me” syndrome is rampant throughout WWW and heavens knows the reminder will do me some good. Can’t wait to check out your site. You expressed it very well Glenn. Indeed, it’s when you focus on what your reader wants that you begin to write or offer something that would greatly benefit them. I like your illustration to support what you are trying to say in this post. However, in my location (I live in the Philippines), it’s hard to try to “impose” (or “persuade”) upon my possible readers that this is what you need and you can benefit a lot from them. I believe that learning would come in due time. Meanwhile, I will just apply the tested and proven principles on blogging and keep hoping that somehow they would come to a point that they would really care, especially when I will be offering something that is irresistible. Thank you very much for this awesome post. I totally agree with you on that. I think my first few posts when I started out were all over the place and I didn’t really find where I needed my blog to be. Your right about some headlines that seem so “me” focused. I feel like throwing up when I see stuff like that because it’s all about “me, me, me” and at that point, I can careless. I want to know what’s in it for me always or I am gone. You hit it on the nail with this post. Nicely done! I think a lot depends on what’s being promoted as well… what the product is… and whether the product IS the person who writes the blog [the life they live and what they make and/or do] People are insatiably interested in other people… but perhaps only through the filter of their own experience…. and how it might relate to them. Great to see you on CopyBlogger, and brilliant advice as always! I agree that focusing on our clients is important, if they don’t see what’s in it for them, they stop reading. That’s why when I write I keep a little bit of paper above my computer screen that says, So what? But how about this comment? Though displaying the full name is not ideal, it definitely seems to be capturing people’s attention, and it’s converting into ‘Likes’. How do you know how much of your name is too much? websites, and it doesn’t seem to hurt their business at all. Nice post man and really good title. When you mentioned ViperChill, I realized that I’ve heard of your blog before. I’ve just subscribed to your blog. Food for thought . . . it’s really difficult for many people to write content in a way that speaks to the visitor about their own problems in a way that is compellng and offers value. In doing so, readers will come to trust you, which means they will put more faith in the products/services you recommend on your blog. Put the needs of your readers first and foremost. Being genuinely helpful will pay off in time. Thanks for a great post! I learned a lot from your post, Glen. Lately I’ve been working on becoming more personal with my writing but still need much more practice. I like how you put it, “be personal (but not to personal)”. Also, to gradually let your loyal readers get to know more about you through your content. Not by an information-overload and telling them to much all at once. Great post! I learned a lot from this post Glen… You can also help a lot of people with the information you are sharing… Thanks for sharing the post! Thanks for spreading this wonderful information. I have always believed in providing value content for my readers with minimal “I’s”, “me’s”, and “my’s”. You’re so right in that self-bragging doesn’t lead you anywhere but only decreases your readership. I did find this post filled with about 5% of those personal pronouns, but I guess it was needed to explain your personal thought and observation. Seems to me content written in a personal style is a large part of personal branding. Very little “I” or “we” needed. On that topic, ‘I’s’ aren’t always a bad thing. What annoys me more is when people try to avoid them and just fill the screen with ‘we’. It’s more a case of ensuring you’re interesting to your readers, and that takes knowing how they think, so you can judge it properly. Some people do extremely well with a very personal-based brand — as someone mentioned above, Joe Vitale would be an example. But he still has to deliver the value first and foremost. If Vitale didn’t talk authoritatively about topics people found extremely interesting, no one would give a damn about his personality. Same with Dan Kennedy, Martha Stewart, Johnny B. Truant, Grandma Mary. Perez Hilton is just another annoying drama queen unless he can give us what we want — in his case, the dirt on our favorite celebrities. Sonia/Patrick: The one exception to using the “we” and “us”, I believe, is when you could otherwise be perceived as being condescending or critical. Putting yourself and the reader in the same “we” can be a good technique, I’ve found. I guess it comes down to “whats in it for me?” Most people want to improve their lives by reading, learning and how to make more money or lots of money. So true! What continues to mystify me are freelance writers who sell writing services – and then blog about making money as a writer or the freelance writer’s life. I tried that route once – and then opened my eyes! Your clients care about how you can help them – not the nitty gritty of how you got there. (Resources that are actually there to help writers – like this – fit under a different category of course). Since you’ve gone out of your way to cite a specific split test you recently conducted regarding two different headlines, why not give us the exact numbers instead of just saying “by a huge margin”. Sorry, Glen, too vague to truly prove a point. I always tell people to count the number of times they’ve used “we”, “our”, “us” etc. and then each “you”, “your”, and “yours”. If there’s a lot of “we” and not much “you”, there’s a problem. There’s also an online we-we calculator that will do the job automagically. Love the graphic for the post, by the way. Good post-it is very easy to lose sight of what you are trying to do because of the number of tasks to take care of..this is a good reminder of what is important. Great content! My favorite line is Drip, Drip, Drip – a new image for me to use in my writing. There’s a fine line between self-promotion and a me-me-me mentality! Great post. Thank you! I’ve just posted a blog post linking to this post. I find (because it’s all about me) is that I write alot of stuff with me as the focus. Then about half way through that I go back and rewrite it about the reader. That seems to work for me in terms of making a start and then reshaping the topic. An image of kneading dough comes to mind for some reason. It’s all fine, but I still believe that no matter how much the potential clients are looking for “what’s in it for me?”, people are still curious about people, and when you share your experience, and your pain, and what you’ve learned, you simply cannot fous on them. Why do you think “Chicken Soup” series is so popular? Why every good magazine, including Reader’s Digest, has a TOT story as a feature most of the time? So this refer to the more you give, the more you get. Just finished Stephen Kings ‘on writing’ and he comments that he pictures his ‘ideal reader’ and writes just for that ONE person. Like a real conversation, not a speech to a crowd. This works, and helps to get inside the head of your reader, to imagine their problem. Once you have done that you have a head start in helping them solve it. I think the hardest part about starting a good blog is knowing what people want to read. You’re right, but finding subjects that aren’t personal is tough! Good post. You’ve really got a good thing going here Glenn. Coming up with a good topic that’s sure to take the readers attention is always the biggest dilemma of each blogger or writer for that matter. This totally eases the burden for us. Great post. Looking forward to more soon. Great advice! As content creators or even designers, it’s easy to forget that we also like to consume information. And I usually stumble onto a blog based what will be done for me in one way or another. Thank you for writing this guest post. It is spot on. As usual, you have made some valid points here. 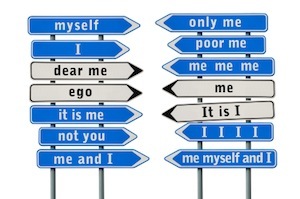 The self-centred approach: I, Me, Mine. The other-centred approach: How may I help you? What can I do to make you feel better? What are your concerns? What applies to marketing also applies to human psychology or human behaviour in general. Yes, artists tend to write about their personal lives. However, it is only when the link is established between the personal to the universal does it become a smash hit. The music industry is full of musicians who became popular because they were able to write songs which appealed to the general public. People like to read or listen to something they can relate to. The writer has to make a connection with his target audience. Identify a problem and find a solution; find a need and fill it, but from the “other’s” point of view. If you only care about yourself, the people will take their business elsewhere. The customer is not always right, but the cash in his pocket sure makes sense to your business. If it does not, well, you no longer have a business. Cheerio. Having read this post, I went back and read a few of the other posts I recently read and guess what ? I never noticed it before (I suppose I wasn’t looking) but the ones I was most impressed with had the same type of reader outlook as you have explained, supplying good conent for the reader with some personal touches. The others were more Me, my, mine… not such good reading. So something else to keep in mind when composing my future posts.